Chickweed (Stellaria media) is a common cool-weather “weed” that grows abundantly throughout North America and other temperate regions around the world. It also happens to be edible, nutritious, and have a long history of medicinal use. Chickweed is not native to the US. Rather, it was brought over by European immigrants, but can now be found in all 50 US states. A young chickweed (Stellaria media) plant begins its slow, steady crawl outward across the soil surface. The extent of its geographic distribution gives you a sense of just how robust and hardy this little plant is! Cerastium arvense (field chickweed) – A perennial herb that produces 1-2′ tall flower stalks with attractive white flowers in the spring. The plant and flowers look similar to dianthus, its relative. Field chickweed is rare in our region (the southeastern US) but common elsewhere throughout the US. Field chickweed is also edible. Cerastium fontanum (mouse-eared chickweed) – Mouse-eared chickweed is another perennial herb imported from Europe that can now be found in all 50 US states. Mouse-eared chickweed is also edible. How do you identify common chickweed (Stellaria media)? 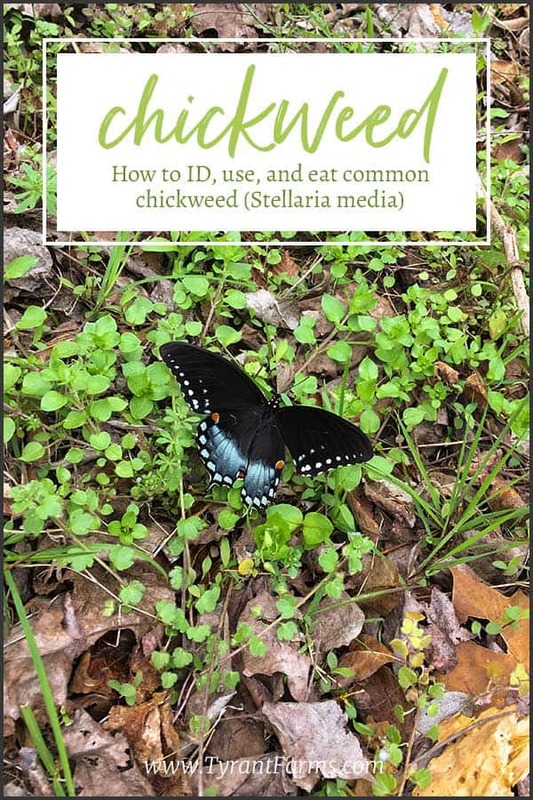 Even though the two plants that share the name “chickweed” with Stellaria media are both edible, it’s still important to be able to positively ID common chickweed (or any wild plant) before you eat it! A lush patch of common chickweed (Stellaria media) glimmering after a late winter rain. Field chickweed (Cerastium arvense) produces tall upright flower stalks with relatively large quarter-sized flowers. 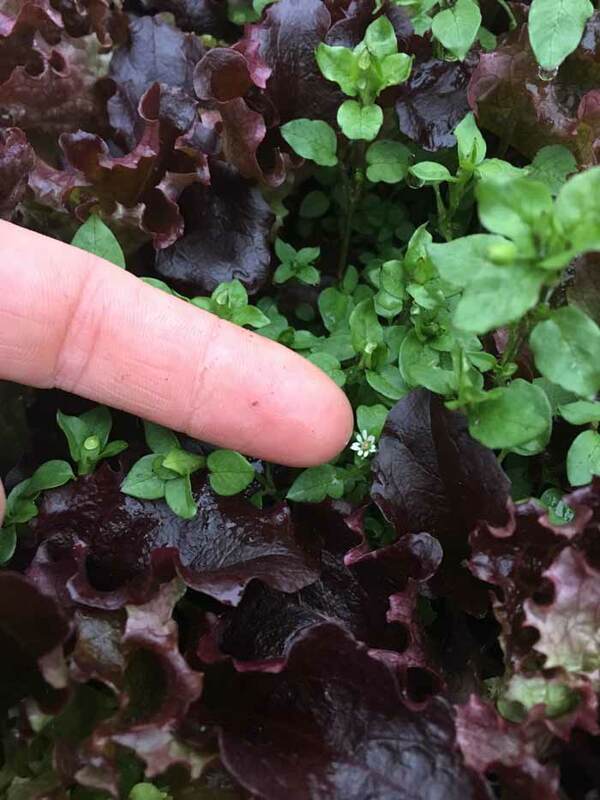 Common chickweed (Stellaria media) does not produce tall flower stalks, instead its tiny white flowers can be found at the end of its low-growing stems which form dense mats on the soil surface. Mouse-eared chickweed (Cerastium fontanum) looks almost indistinguishable from common chickweed, except mouse-eared chickweed has furry stems and leaves. Common chickweed leaves have no fur and the the stems have only a single row of fine, almost imperceptible hairs. 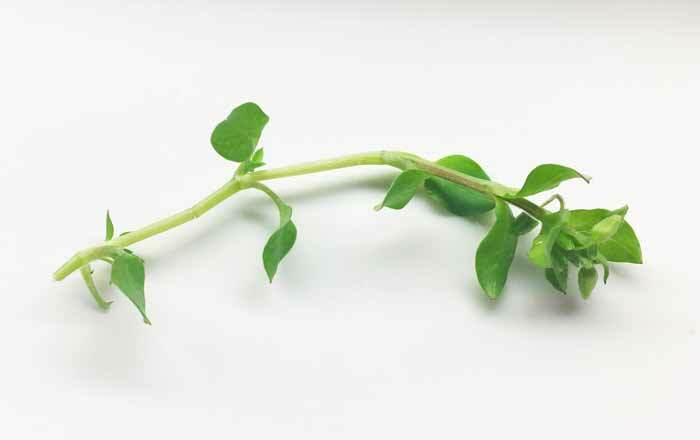 A closer look at a single stem of common chickweed (Stellaria media). Chickweed: What’s in a name? Often, a plant’s common and botanical names can both serve to tell you about important features and characteristics. Why did European immigrants call it “chickweed”? It’s a plant that grows like a weed, and it’s beloved by adult chickens and their chicks alike. Our friend’s chicken foraging a late-season patch of chickweed. On a related note, one of the reasons we intentionally grow chickweed is because our ducks absolutely love eating it (we do too). What does chickweed’s botanical name, Stellaria media, tell us? Stella is Latin for “star” and stellaris means “starry.” This perfectly describes chickweed’s tiny, white star-shaped flower structure. A star-shaped chickweed flower. This patch of chickweed is growing amidst red lettuce plants, making for a striking color contrast. As for media, that simply means “intermediate” or “middle ground” in Latin. Throw these names into a pot, and you might be able to surmise a medium-sized plant beloved by chickens, covered with star-shaped flowers. You’re dang skippy you can eat chickweed. 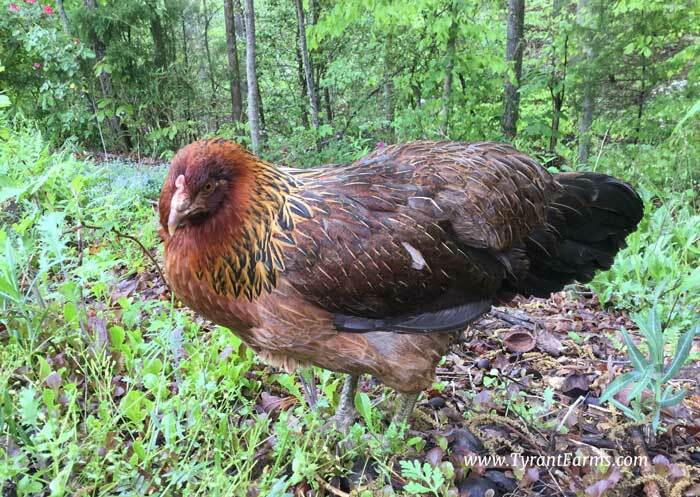 (That’s southern for “yes.”) The Tyrant and I eat mounds of chickweed from winter through spring. Chickweed on the cutting board at Tyrant Farms. What does chickweed taste like? We think chickweed tastes nearly identical to corn silk, the sweet, stringy strands that stick out of the top of an ear of corn. How do you eat chickweed? You can eat chickweed raw or cooked. 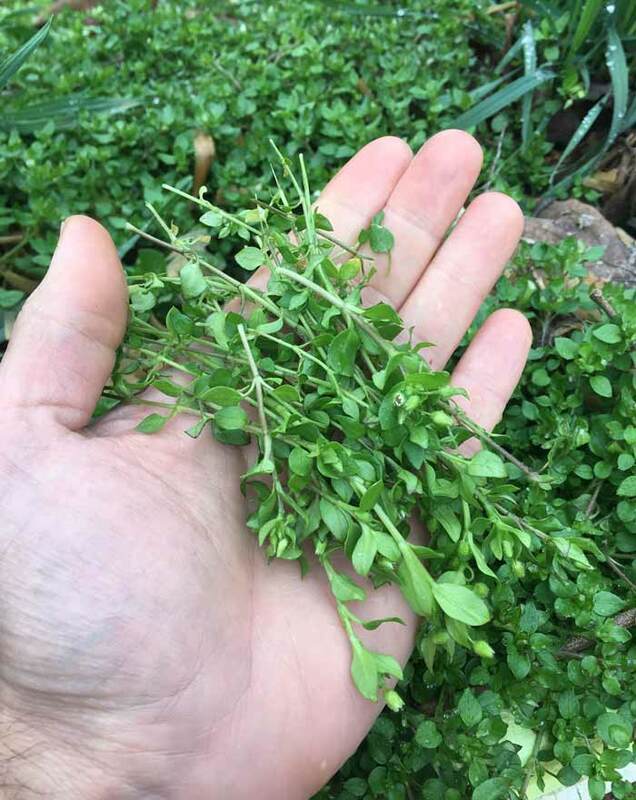 Harvesting is simple: cut clumps of chickweed with pruners or pinch the stems with your fingernails. A handful of raw chickweed ready to be munched on. 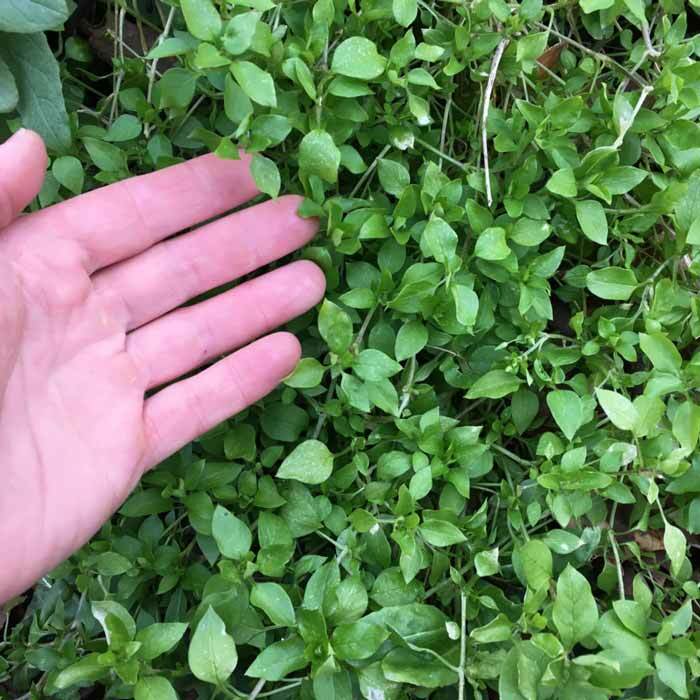 Chickweed is best harvested when the plant is still lush and densely clumped – and before it produces a final long stem covered with flowers/seeds. We graze on hands full of raw chickweed. We also have a favorite chickweed salad recipe we make during peak chickweed season. 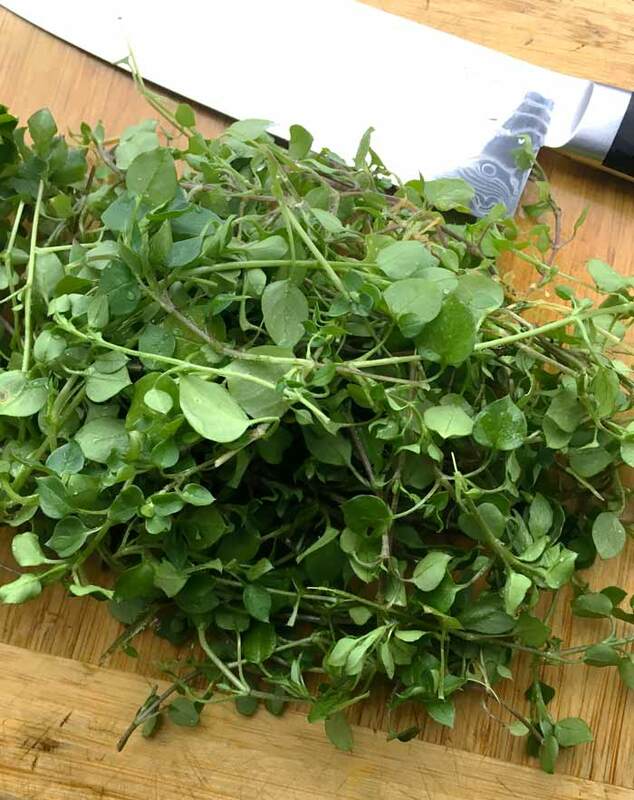 We use chickweed generously as a garnish on soups, dumplings, and pot pies. If you’re looking for a cooked application for chickweed, find any spinach recipe and substitute chickweed 1:1 for spinach in the recipe. Pesticides – Be sure not to eat chickweed grown in a pesticide-sprayed yard or park. Instead, only eat chickweed from spots you know are pesticide-free. Pregnant women – Like many other commonly eaten plants, chickweed contains small quantities of saponins. In the amounts found in whole foods, saponins have a wide range of health benefits. However, if you repeatedly ate huge quantities of chickweed, you could consume a potentially dangerous amount of saponins. That’s why pregnant women are generally advised not to eat chickweed. When and where can chickweed be found? Chickweed is a cool weather plant that doesn’t like temperatures over the mid-70s. 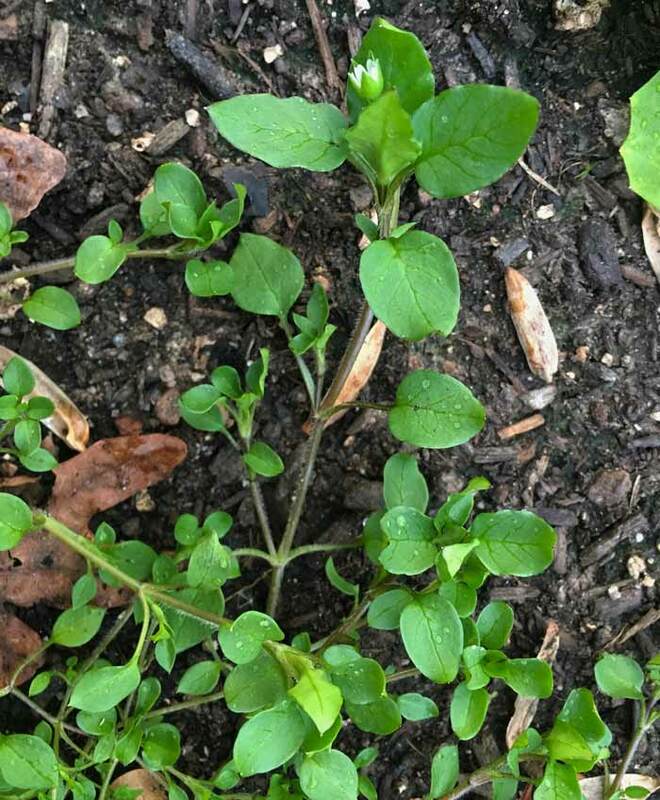 In our area (Zone 7b), chickweed starts germinating in the fall, stays small through the coldest months of winter, then explodes from late winter through early spring. Chickweed grows everywhere: open lawns, forest edges, and even deep under the dormant canopy of old-growth forests. 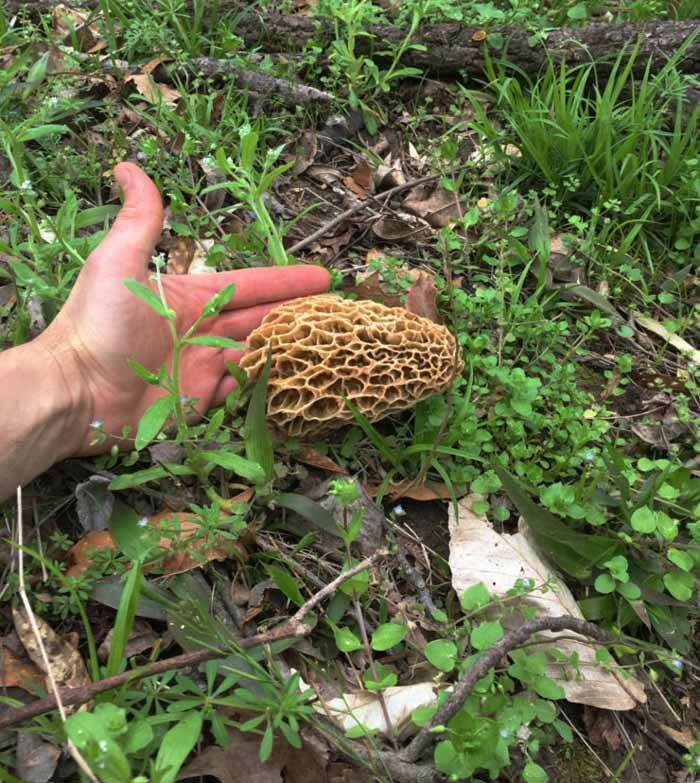 In fact, chickweed is usually at peak when morel mushrooms are fruiting, meaning lots of forest-to-table meals at our house. A beautiful blonde morel mushroom fruiting in March. Notice the patch of chickweed right next to it? There are also a few other edible wild plants in this photo. By late-April, chickweed has gone to seed and died. All that’s left is a desiccated mat of dead leaves that help feed the soil food web and provide fertilizer for next year’s chickweed seeds. In cooler climates, chickweed grows throughout the summer. What are the health benefits of chickweed? Is it nutritious? Only 10% of Americans eat enough fruits & veggies on a daily basis. That means there are nearly 300,000,000 fiber- and nutrient-starved people in the country. That’s a national emergency if there ever was one. 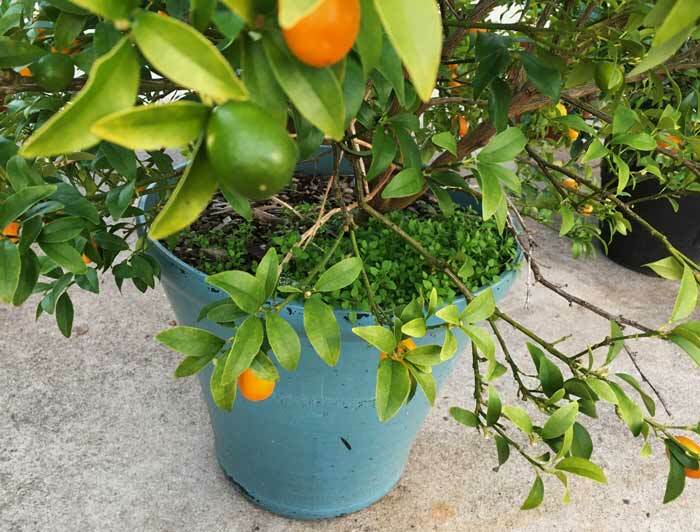 We also grow chickweed in our potted citrus containers, like this kumquat plant. That way, it’s easy to get a serving of fresh fruits and veggies from the same pot! Granted, it’s hard for many people to access fresh, local fruits and veggies. One part of a larger solution set: we think it’s high time more people learn to identify and eat their weeds. We’d be willing to bet that ounce per ounce, chickweed is higher in nearly every vitamin and mineral than most any leafy green you’d find at a grocery store. Chickweed has a long tradition in use as folk medicine in multiple cultures around the world. Its uses include treatment of various skin conditions (acne, burn treatment, bug bites, itchy skin, etc), pulmonary diseases, scurvy (Vitamin C deficiency), anemia (iron deficiency), bronchitis, arthritis, and more. A mound of edible medicine? Chickweed is certainly good for you as a vitamin and mineral-rich veggie, and it likely has medicinal qualities too. Unfortunately, virtually no modern research has been conducted to conclusively determine the medical effectiveness of chickweed. One study did show that chickweed showed promise as a potential anti-obesity drug. It is interesting to read through hundreds of glowing consumer product reviews of chickweed salve used to treat skin conditions. If you’d prefer to make your own chickweed salve rather than buy it, here’s a good recipe. What is the best way to get rid of chickweed or get it out my flowerbeds? How do you control chickweed? Even though its edible and medicinal to humans and its flower provide pollen for countless numbers of small pollinating insects, common chickweed (Stellaria media) is often considered a weed by people. Understand that chickweed is a beneficial plant that serves numerous ecosystem services. Chickweed has a relatively short lifespan and will be gone as soon as the weather warms up. You can eat chickweed. Congratulations, who knew that organic gardening could be so easy?! Instead of seeing chickweed as a problem, look at it as solution to other problems (free organic food, more pollinator habitat, etc). If you still have to get rid of the chickweed in your grass in order to impress your snarling neighbors or abide by HOA rules, simply mow it or weed whack it rather than poisoning it. To get chickweed out of your flowerbeds, smother it with 3-4″ of wood chip mulch. You can also preemptively use wood chip mulch to keep chickweed seeds from germinating in the first place. 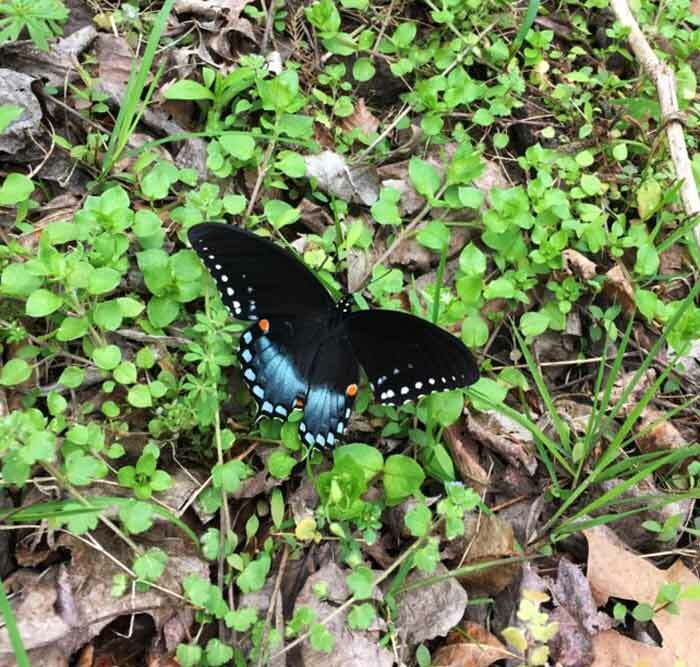 A gorgeous spicebush swallowtail butterfly (Papilio troilus) resting on a patch of chickweed, perhaps to get a sip of water. Please avoid using synthetic pesticides on plants in your yard. The best method to control chickweed in your yard? Eat it. How do you grow chickweed? Where can you get chickweed seeds? 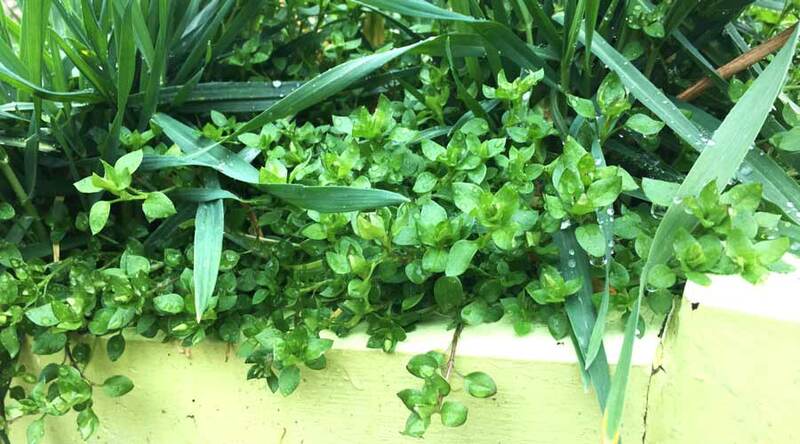 Chickweed is an edible wild green that grows itself – no effort required. You don’t have to water it, fertilize it, tend it, or do anything to it. It grows in full sun or shade. 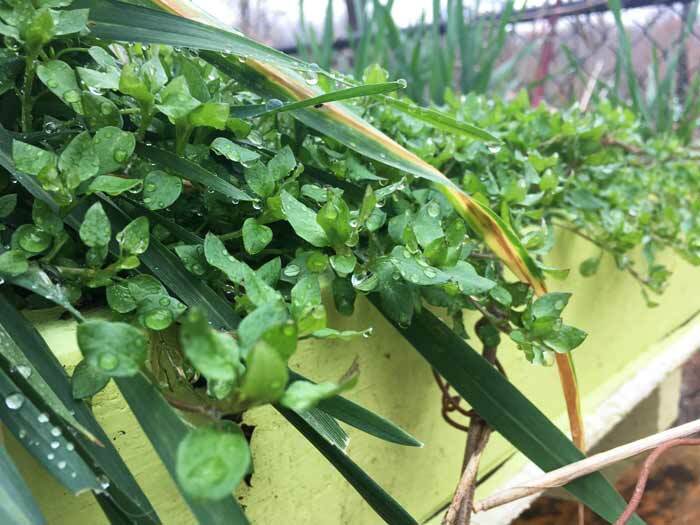 We also grow chickweed on the living roof of our duck house, aka the Quacker Box. Since our ducks love fresh chickweed, it’s nice to have it nearby for a treat. The chickweed seeds out and comes back each year on the roof, no planning necessary. Chickweed self-pollinates, although we do see small flies and parasitoid wasps foraging its flowers. Chickweed does grow best (thicker, larger, juicier plants) in rich, moist soil that’s high in organic matter. 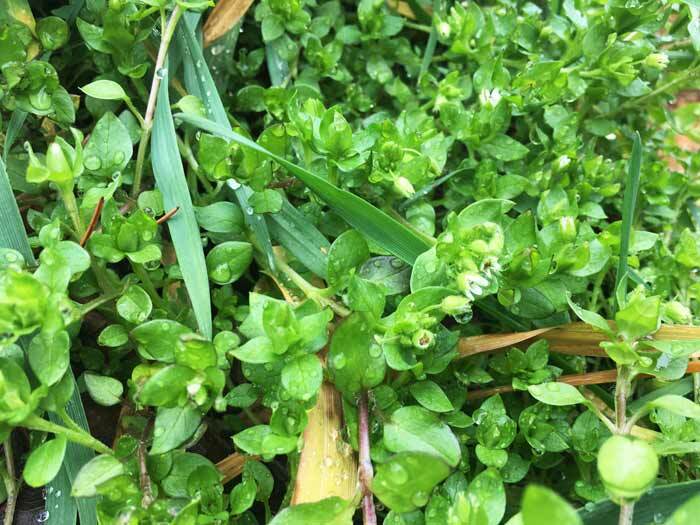 Chances are that if your average daytime temperatures aren’t higher than the mid-70s and aren’t consistently far below freezing at night, there’s chickweed growing in or near your yard right now! Chickweed is an annual plant, but it readily re-seeds, coming back in the same spot year-after-year. 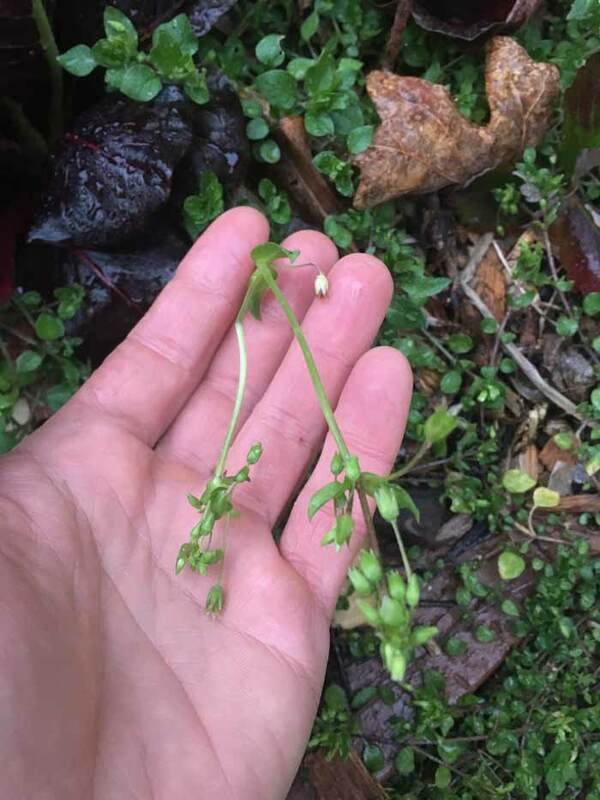 At the end of its lifecycle as the weather warms, a chickweed plant’s stems will grow long, thin segments with a final flower/seed cluster on the tip. Once the seeds mature, the plant will die, leaving behind plenty of seeds for the following cool season. While you can buy chickweed seeds online, consider sourcing seeds from the plants already growing around you. After reading this article, we hope you’ll never look at chickweed the same again! In fact, we hope you’ll start looking at chickweed as one of many plants in nature’s free and abundant grocery store.